My mother was born and raised in San Juan until she moved to the United States as a teenager and when I was younger she often reminisced about her days growing up in Puerto Rico. I have always wanted to experience the culture my mom was raised in first hand and this curiosity about my heritage finally brought me to Puerto Rico. The trip turned out to be quite an experience and looking back I wonder why it took me so long to finally make it there. Fajardo is a quaint coastal town a few hours from San Juan by car. The town is known for its bizarre bioflourescent lagoon. My cousin Aida explained to me the water's algae glow green when disturbed at night by some odd photo-biological phenomenon. By the time we arrived in Fajardo it was 10 PM, the sun had long set and a steady refreshing drizzle was interrupted by heavier down pours. We rented two canoes and then we set off for a narrow canal leading to the bioflourecent lagoon. The canal waters were pitch-black with the faint moonlight guiding our way. Along the way we kept getting hit by the low lying branches in the shear darkness of the canal. It took us a while to coordinate rowing our oars in the same direction as we occasionally veered into the dense vegetation lining the shores of the canal leading to the lagoon. The canal might have been the most fantastic part of the journey to the lagoon. As we approached the lagoon the water started to glow a bizarre green. The oars caused turbulence in the water and with each stroke they seemed to be surrounded by a green streak of light underwater. As if that weren’t fascinating enough, a heavy rain started back in with the amazing effect of illuminating the entire surface of the water and as each raindrop hit the water a transient green glow sparked on the surface. The entire canal soon was covered by a vast blanket of green flickers of light as each raindrop created enough turbulence to cause the bioflourescent algae glow. Once in the lagoon I jumped in for a swim. I felt oddly like a comic book superhero as my hands and legs created a flame-like green glow underneath the water as I swam. Fajardo, another place to check of my to do list. 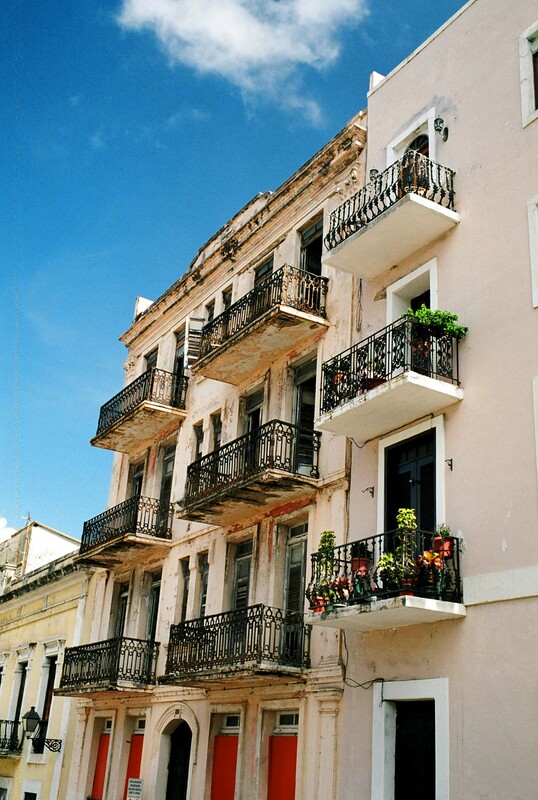 Old San Juan with its colonial charm is a world upon itself. Scenic plazas decorated with bright flowers and aging pastel colored houses fronted with wrought iron balconies line the narrow cobblestone streets as pigeons scurry through the air above. Old San Juan is beaming with culture with diminutive art galleries, museums, and colonial churches popping up around every corner. The walled city is highlighted by El Morro, the striking Spanish colonial fort basking above the Caribbean waters at the northern tip of the city. The massive 6 level fort was first built by the Spanish in 1539 and is said to be the oldest Spanish fort in the New world. My mother gave me contact information for my cousins Jorge and Aida and a host of other extended family and cousins in San Juan whom I had never met. Jorge calls himself "the ambassador" for my mother’s side of the family and he showed us quite a time. Jorge took us all out to eat Mofungo, a sort of banana paste meal cooked at a local restaurant. Jorge drove us all around the city past the sparkling beaches of Santurce, Miramar, and Condado with its teaming nightlife. His wife is a vocalist and sang amazing Puerto Rican ballads in the car as we toured the island. Perhaps the most interesting place we visited was the house my mother grew up in. It was located on a shady avenue and all the houses were painted in lightly colored pastels each with a small patio and white wrought iron gate. We later met up with more of my cousins for diner and they regaled me with myriad stories about my mother and grandparents life in Puerto Rico in the 50’s and 60’s. The next day we met another of my cousins. Aida and her husband met us in Old San Juan and took us on a tour of the island. We all headed for El Yunque rain forest for an afternoon of hiking. True to its name it rained the whole time we were there. The weather was hot and humid and the rain was refreshing to say the least. The hike winded up and down a large hill in El Yunque National Park. Eventually we came to a large gushing waterfall and we swam out to the cascading somewhat frigid water. My cousins had found the perfect waterfall. Aida and everyone else watched as I got pummeled by the tumbling waterfall. Later Aida and her husband prepared a delectable home cooked dinner of Caribbean shrimp and Spanish rice and then we headed off to crazy waters of Fajordo. The wonderful hospitality of my extended Puerto Rican family and the laid back culture of Puerto Rico was refreshing and I hope to go back again with my mother and family one of these days. 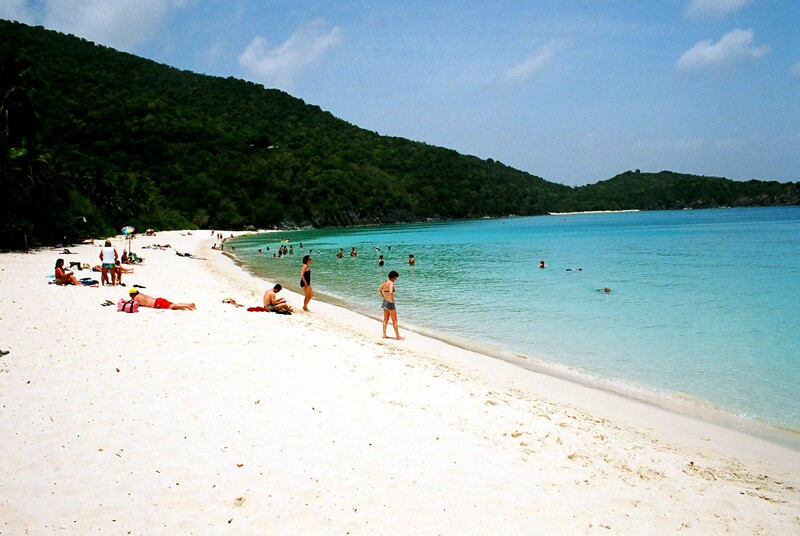 The US Virgin Islands are comprised of the main islands of St. John, St. Thomas, St. Croix, and Water Island along with a smattering of smaller islands. The first stop after leaving Puerto Rico was St. Thomas. From there we took a cab and then a ferry to the nearby island of St. John. I would be remiss if I did not emphasize that by all appearances St. John is as close of an approximation to an island paradise as I’ve come across in my travels. Trunk bay is a remarkable beach best reached by taking a small boat across from St. Thomas to St. John and then riding on the back of a truck to the beach. The idyllic beach is inviting with swaying palm trees shading an impossibility stunning white sandy beach and a tiny rocky island not far from the beach. The tranquil water is unbelievably pristine and as you swim looking down it is literally as clear as a swimming pool. Lounging in the placid water almost feels like hanging out in a massive fish tank as colorful tropical fish, eels, small stingrays, and other assorted tropical creatures swim about the warm waters. 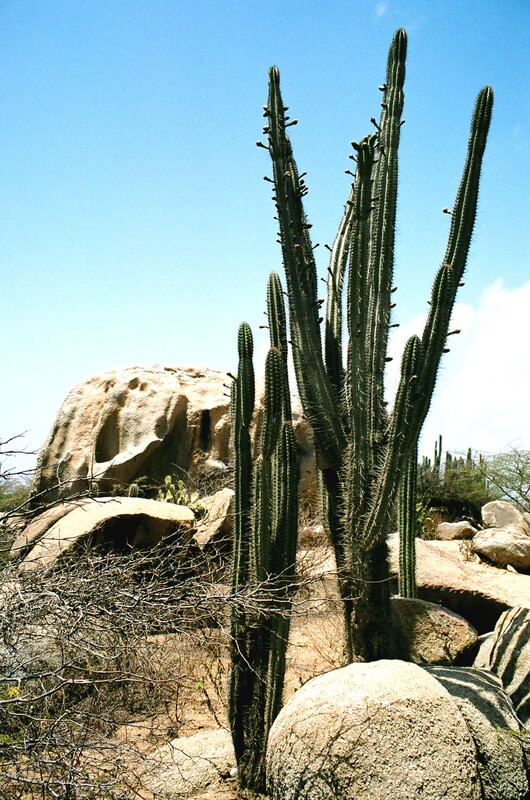 Aruba is an arid windswept island with desert features and abundant cacti located 27 km off the coast of Venezuela. The beaches were just as exquisite as other beaches in the Caribbean with the requisite white sandy beaches and endless blue waters. A small lighthouse sits on the northern end of the beach. Perhaps the most interesting thing to do on the island is snorkeling or diving around the shipwreck of a German freighter named The Antilla. The Antilla sunk in the shallow waters just off the beach in 1940. Germany had invaded the Netherlands in 1940 as the Antilla was anchored off the coast of the Dutch colony of Aruba a world away. Aruba held strategic significance at the time because of its abundant oil reserves that heavily supplied the allied war effort. Dutch ships surrounded the Antilla and the Captain decided to sink the ship by running it aground rather than surrender. The 397 foot hull sits in 2 massive pieces just meters below the water and makes for amazing snorkeling as the fish dart in and out of the massive hull of the ship. We had taken a catamaran out to the dive site and later watched the sun set from the catamaran as we sailed back to shore. As I snorkeled in the waters I could see turtles, eels, and brightly colored schools of fish darting back and forth in synchrony in and out of cracks and cavities in the sunken hull. Dominica was the next stop on the leisurely tour of the Lesser Antilles. 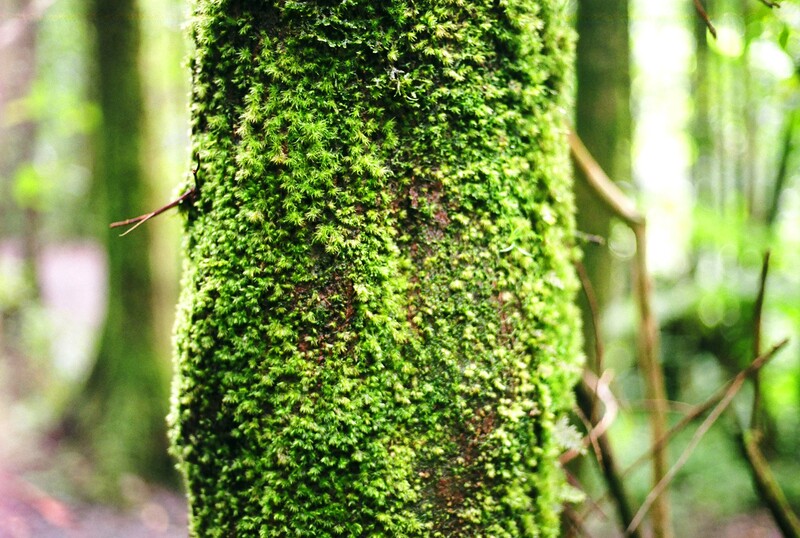 Dominica is a lush volcanic island with an abundance of rain forest. The hikes in and out of the forest were breath taking. Swimming in the obligatory waterfall or two was refreshing after hiking for hours. The island is run down in parts but some amazing colonial buildings add to the richness of the island. There was a nice colonial era sugar mill at one part of the island. Roseau is the island's rather small capital city. The town is most notable for its abundant markets and there is a smattering of aging churches with spires sprouting above the crowded maze of surrounding building. 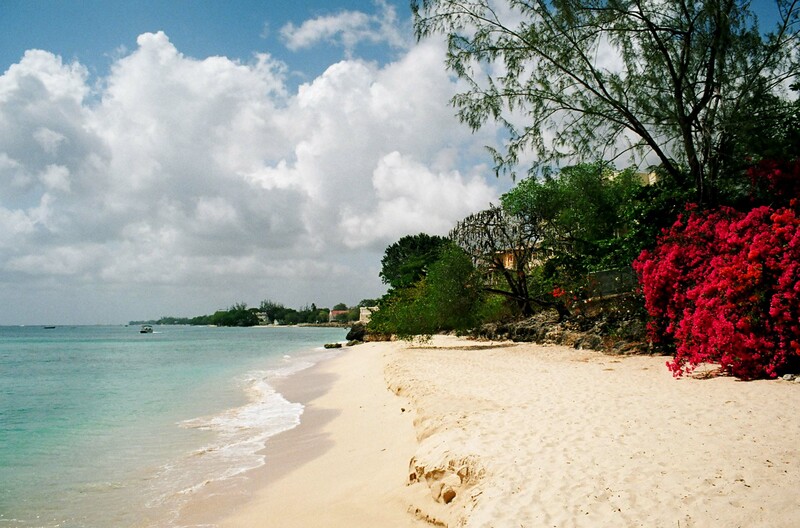 The cheapest and most interesting way of getting to some of the nicer beaches in Barbados is by local bus. The local buses are colorfully decorated with electrical designs and equipped with massive speakers and subwoofers lest you not be able to actually feel the bass. Dance hall and reggae blast the whole way giving you a first hand feel for the island beats. In this manner the buses have a festive feel to them and indeed one feels like riding the buses more than you need to just for the fun of it. The beaches are long expanses of untrammeled white sand and clear blue splashing sea. Bridgetown is the bustling capital brimming with assorted markets and chaotic streets.